Home ABOMINATIONS WESTERN RACISM AND HYPOCRISY FOAMING AT THE MOUTH OVER CHINA’S CONSTITUTIONAL CHANGES. CHINA RISING RADIO SINOLAND 180301 | The buck stops with YOU. If you don’t share this, who will? 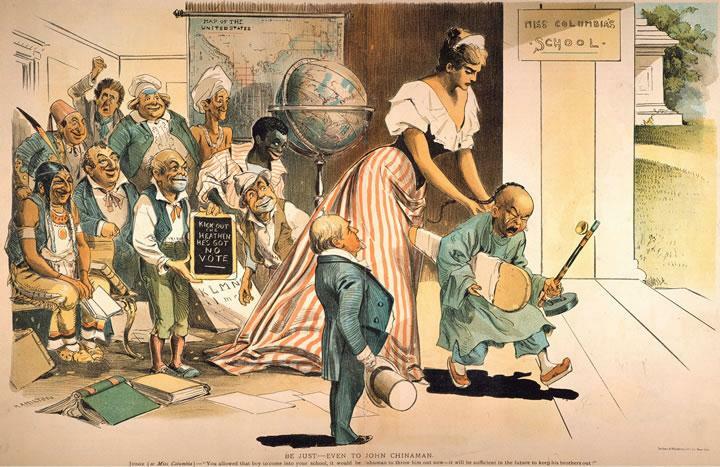 Above, entitled Be Just – Even to John Chinaman, this is one of thousands of racist political cartoons against the Chinese in the United States, especially with the passage of the 1882 Chinese Exclusion Act. It legalized the extermination of tens of thousands of Chinese, who were hunted down like dogs, shot, hung and scalped for state bounty All the racial stereotypes are there. John is crying like a baby, while carrying an ironing board, iron and an opium pipe: a cowardly drug addict who does women’s work. Downloadable SoundCloud podcast (also at the bottom of this page), as well as being syndicated on iTunes and Stitcher Radio (links below). 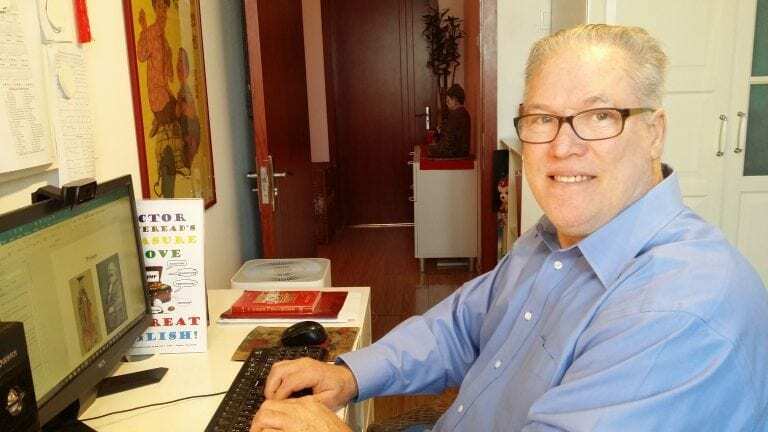 It has been incredible to watch Western propaganda march in symphonic lockstep against China’s proposed changes to its national constitution, to allow the President and Vice President to serve more than two five-year terms, among about 25 other modifications. Even close to home, the South China Morning Post went all haywire at Baba Beijing using its very functional and participatory communist-socialist democracy to change its laws (http://www.scmp.com/news/china/diplomacy-defence/article/2134791/end-term-limits-top-may-be-start-global-backlash-china). Across the West, words like dictator and totalitarian are being bandied about with indignant self-righteousness: How dare the Chinese, they refuse to adopt our superior Western way of life (https://www.theguardian.com/world/2018/feb/26/xi-jinping-china-presidential-limit-scrap-dictator-for-life)! It depends on your definition of superior, of course, but the Chinese people definitely demur.So called “China experts” are piling on with all kinds of doomsday the-sky-is-falling scenarios (https://www.nytimes.com/2018/02/25/world/asia/china-xi-jinping.html). President Xi Jinping is being portrayed as megalomaniac, power hungry tyrant. His 1.4 billion citizens respectfully disagree. Yet, in China, here are 1.4 billion people in the world’s largest functioning, participatory democracy, fully engaged in the media and with their government, to discuss important changes to the people’s constitution. Was the “Patriot” Act offered to US citizens for consideration? Of course not. Yet China’s proposed constitutional changes, as well as all other laws and regulations under debate are everywhere in China’s media. Every citizen, using social media platforms, which is the vast majority of them, can make observations, suggestions and criticisms about these and all other law proposals, via government internet portals and phone applications. Millions do so, every day. As a resident of China, I also have the same rights and have done so. Not tech savvy? Then you can meet with your elected local representative, who lives in your area, or go to town hall, which I have also done so on more than one occasion. Finally, Godfree Roberts, who has been on my show many times, just did an excellent analysis of the law change proposals and their background and inspiration (https://www.greanvillepost.com/2018/02/25/why-does-the-cpc-want-to-remove-the-expression-that-the-president-and-vice-president-of-the-peoples-republic-of-china-shall-serve-no-more-than-two-consecutive-terms-from-the-countrys-constitut/). Nothing to do with race. Nice try. A country is not a race. Though it does have everything to do with being anti-communism, etc. Is there some hypocrisy? Definitely. Yet not for the reasons you are presenting. People often cry racism on things that have nothing to do with racism unless you view everything as a generalization and thus only see a country or nation as being one race. I don’t know if any countries fit that description. The hypocrisy is that the abuse of the oligarchs and plutocrats is just as active in the west as it is in the east. This is a global problem.